After getting thrashed by the Kiwis in the fourth ODI at Hamilton, 'Team India' would be eyeing to finish the series on a winning note. Trent Boult ripped through the Indian batting lineup with his swinging lethal bowling attack. The visitors were bundled out for a paltry 92 runs on the board in 30.5 overs. In the last decade or so, this was India’s lowest innings score in an ODI. Rohit Sharma and his troops must be eager to bounce back in the final ODI to seal the series by 4-1. 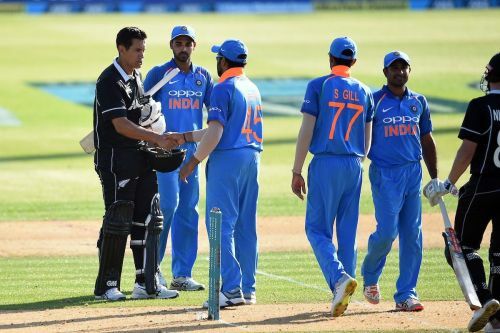 Indian batsmen found themselves under trouble against some quality swing bowling of Trent Boult. Colin de Grandhomme also kept the Indian batting lineup under the pump. The duo tormented the Indian batsmen and shred 8 wickets between them to register an iconic victory for the home side. The Blackcaps chased down the total easily after a couple of early breakthroughs by Bhuvaneshwar Kumar. They won the game in just 15 overs with 8 wickets in hand. Kane Williamson was ecstatic by his team’s performance and would be hoping to repeat such dominant performance in the final ODI. This was the prime example of how pitch conditions play an important factor in limited overs cricket. The final ODI will surely be an epic encounter where both the sides will be looking to outplay one another. India would be eyeing to avenge their humiliating defeat in Hamilton and gain some momentum for the upcoming T20I series. Whereas, the hosts need must be hoping to defeat India in the final ODI to wrap up the series at 3-2 and gain some confidence for the T20 clash. Date: Sunday, February 03, 2019. Dhoni is fit after missing the last two ODIs due to injury. Dhoni can replace Dinesh Karthik in the playing11. Martin Guptill can miss out due to a back injury. Colin Munro may replace Guptill in the starting lineup. Virat Kohli, Rohit Sharma, Shikhar Dhawan, Ambati Rayudu, Dinesh Karthik, Kedar Jadhav, MS Dhoni, Kuldeep Yadav, Yuzvendra Chahal, Hardik Pandya, Ravindra Jadeja, Bhuvneshwar Kumar, Mohammed Siraj, K Khaleel Ahmed, Mohammed Shami, Vijay Shankar, Shubman Gill.